Whether you like your grapefruit fresh for breakfast or it’s juice in a cocktail for some bite, a Paloma Pink Grapefruit Shot is the perfect way to enjoy it! Heat up your 1 cup of water in the microwave or on the stove top. Add 1 cup of sugar and stir until dissolved. Store in your refrigerator until ready to use for up to 3 weeks. 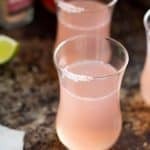 Add tequila, simple syrup, lime juice, and grapefruit juice to a cocktail shaker or large glass. Add the club soda and stir to combine. Get your shot glasses ready by rubbing a small amount of lime juice on the rim of your shot glass and dipping it in the salt. Add a few ice cubes to the shaker, stir, and pour into the shot glasses.